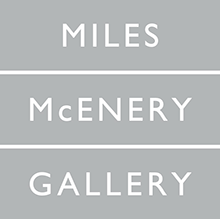 NEW YORK, NEW YORK – AMERINGER | McENERY | YOHE is pleased to announce its representation of artist, Yunhee Min. An exhibition of new works will open in Spring 2016. Yunhee Min’s color choices are energetic and powerful, yet soft and seemingly weightless. Exploring the possibilities in abstraction, Min’s use of squeegees and sprayers distances the hand and ultimately helps to create the ethereal nature of each canvas. Brilliant layers of neon greens, flaming reds, beaming oranges, and welcoming yellows appear translucent and create a sense of depth and spatial complexity. Resplendent and sophisticated, the light produced by Min’s impressive mixture of color envelops the viewer. The atmospheric quality of her works has the blinding effect of the sun. Using vertical bands as her standard composition, Min allows herself to focus on the play of colors. Vision and perception are destabilized through the creation of an endless horizon. 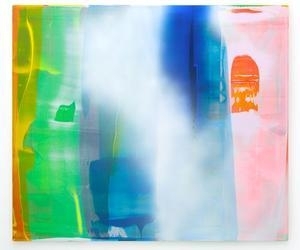 Min’s primary concerns are material presence and optical effects, physical scale and palette. She simultaneously and successfully caters to an appetite for intense color and the role and place of the viewer. Yunhee Min received her Bachelor of Fine Arts degree from the Art Center College of Design in Pasadena, CA in 1991 and her Master in Design Studies from Harvard University, Graduate School of Design in 2008, with additional studies in 1994 at Kunstakademie in Düsseldorf, Germany. Min has had numerous solo exhibitions and projects both nationally and internationally, which include “Into the Sun,” Susanne Vielmetter Los Angeles Projects, Culver City, CA; “For Instance,” Hammer Museum, Los Angeles, CA; “Above and Beyond,” Pasadena Museum of Contemporary Art, CA; “Distance is like the future, Circa Series,” Museum of Contemporary Art San Diego, CA; “Fading Wild,” Finesilver Gallery, San Antonio, TX; “One foot in front of the other,” Or Gallery, Vancouver, British Columbia, Canada; “Fast times,” ACME., Los Angeles, CA, among others. Recent group exhibitions include “Magic Mountain,” Museum of Contemporary Art Santa Barbara, CA ; “Spectra,” San Diego State University Downtown Gallery, San Diego, CA; “Lost line,” Los Angeles County Museum of Art, Los Angeles, CA; “ABCyz,” Launch Exhibition, Silvershed, New York, NY; “The Trans-Aestheticization of Daily Life,” University of California, Riverside Sweeney Gallery, Riverside, CA; “Too much love,” Angles Gallery, Curated by Amy Adler, Los Angeles, CA; “Around About Abstraction,” Weatherspoon Art Museum, Greensboro, NC; “Wall Painting,” University of Texas at San Antonio, San Antonio, TX; “Snap Shot,” UCLA Hammer Museum, Los Angeles, CA (Traveled to Museum of Contemporary Art, North Miami, FL); “Fresh,” Altoids Curiously Strong Collection, New Museum, NY; “KOREAMERICAKOREA,” Sonje Museum of Contemporary Art, Seoul, Korea; “Rundgang,” Kunstakademie Düsseldorf, Düsseldorf, Germany. Her work may be found in the public collections of The UCLA Hammer Museum, Los Angeles, CA; The Los Angeles County Museum of Art, Los Angeles, CA; Museum of Contemporary Art San Diego, La Jolla, CA. Min is a faculty member at the University of California Riverside, Riverside, CA; Emily Carr University of Art + Design, Vancouver, BC, Canada; School of the Museum of Fine Arts, Boston, MA; and the University of California, San Diego, San Diego, CA, among other prominent universities.